Two colors now built in: orange and blue. 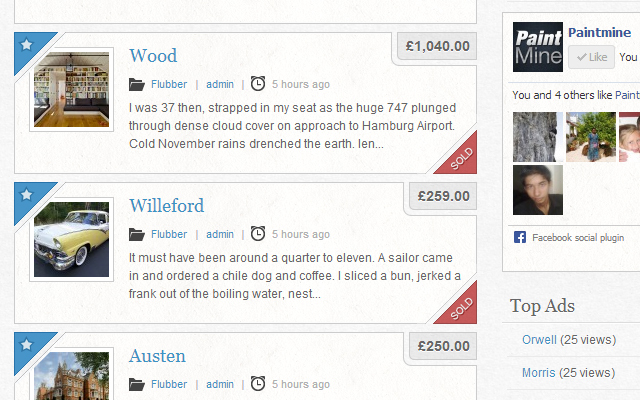 Rebuilt single listings with full width images. A clean, flat, two-color Classipress child-theme with subtle background textures. Will work by itself or as part of a network. 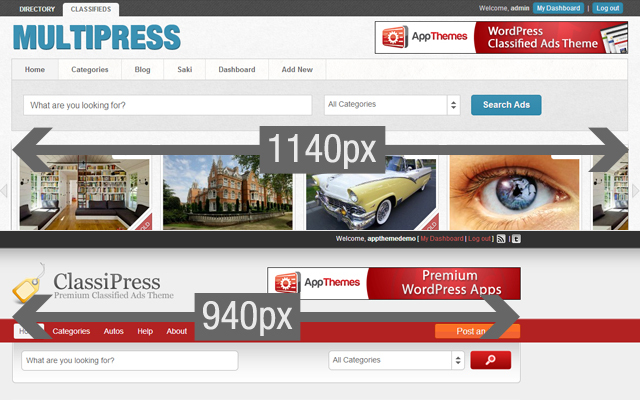 This is part of a larger effort to run multiple AppThemes side-by-side using the WordPress network interface. We’ve built all of our child-themes around the same minimal design and have inserted a new menu at the top of the page to allow easy switching between themes. The style sheets have been divided by color so with a little knowledge of CSS you may create your own color swatches (or you could ask us nicely to create one for you). Content has been completely rebuilt at 1140px to accommodate larger screens. 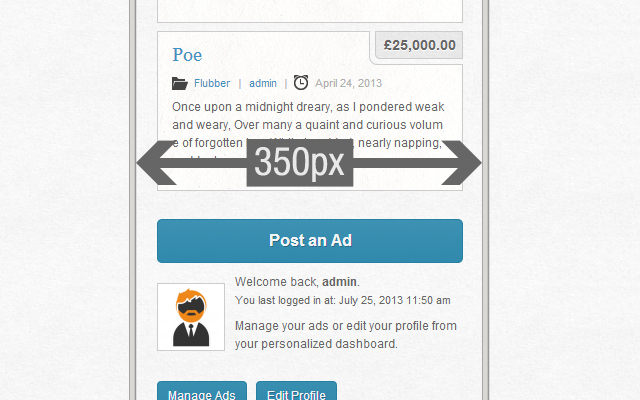 Newly formatted featured slider (no more errors when resizing). Google map shifted to page content to help buyers immediately see how to purchase. Make sure Classipress is installed correctly. 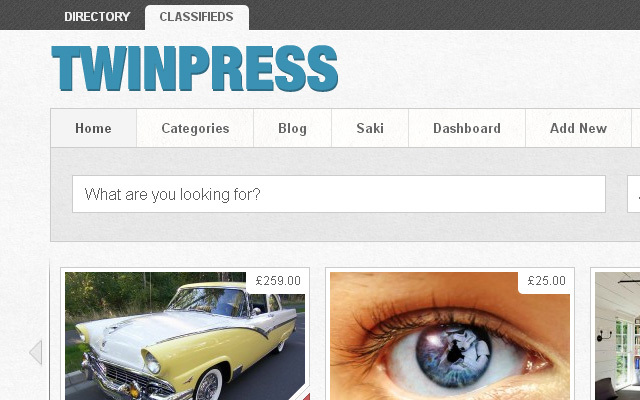 Install the TwinPress Classifieds child theme by navigating to ‘themes > add new > upload’, browse to your ‘twinpress_directory’ zip file and upload. Navigate to ‘appearance > themes’ and activate. (If you’re running a network you will need to make the theme visible through ‘network admin’ first). Navigate to ‘classipress > settings > advanced’ and check ‘disable core stylesheets’. v1.1.0 [16th Sep 13] – Major release. Updated single listings. ‘Blue’ and ‘Orange’ color schemes now available. It looks as though you have not enough featured adverts, the slider will not work right without enough to fill the page width at least. Now I have place some more featured ads but still problem remains. 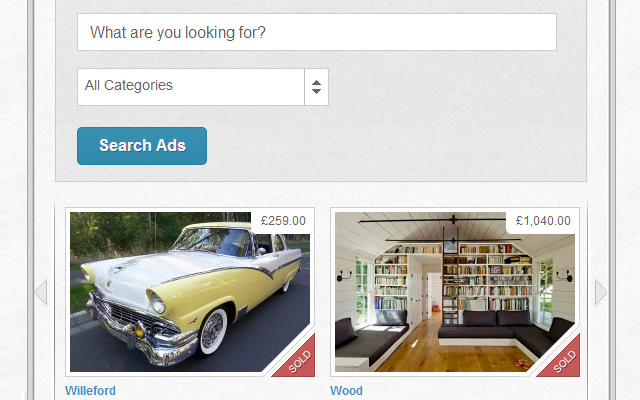 There should not be a problem with not enough featured adverts as original classipress does not have in this case. This is a problem that I’m unable to replicate, could you please let me know your WordPress / Classipress version and hosting setup? Corbs, I fixed the problem with slider. I want to see list of modified files for “v1.1.2 [11th Jan 14] – Minor Release. Various bug fixes”. I have v1.1.0. Since I already fixed few things so don’t want to overwrite them. Where I can see the version history of Twinpress classifieds to see the list of modified files. Thanks Corbs, I am waiting for the list. This is the worst attention ever on appthemes. Check this http://karibumbeya.com/add-new/ the link all of a sudden does not populate the categories, what is the solution? I would like to know if these 2 themes share the same users database ? If a user is publishing a classified ad will it be possible for him to use the same user/password to connect to the directory ?